Hostile Terrain is a Pop-UP Exhibition about America's Humanitarian Crisis at the Southern Border. 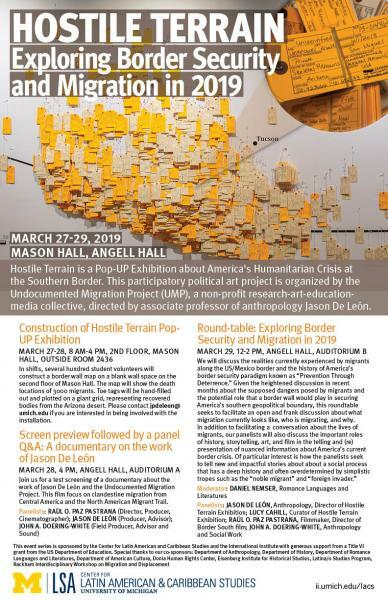 This participatory political art project is organized by the Undocumented Migration Project (UMP), a non-profit research-art-education-media collective, directed by associate professor of anthropology Jason De León. In shifts on March 27-28, 2019, several hundred student volunteers will construct a border wall map on a blank wall space on the second floor of Mason Hall. The map will show the death locations of 3000 migrants. Toe tags will be hand-filled out and plotted on a giant grid, representing recovered bodies from the Arizona desert. Please contact jpdeleon@umich.edu if you are interested in being involved with the installation. The exhibit will remain in Mason Hall through the first week of April 2019. Join us for a test screening of a documentary about the work of Jason De León and the Undocumented Migration Project. This film focus on clandestine migration from Central America and the North American Migrant Trail.